The history of Dunterton near Launceston. | Launceston Then! 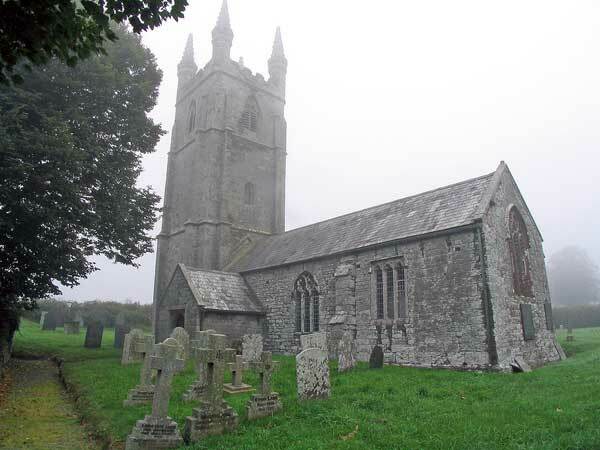 Dunterton, a small scattered parish, in the Tamar valley, is about 5 miles East of Launceston and 7½ miles North West of Tavistock,and covers 1161 acres of land, including Eastacott hamlet. Historically it formed part of Lifton Hundred and is part of the West Devon District Council area. The parish was first mentioned in the Domesday book, when it was recorded that Baldwin held the manor of Dondritona with a Ralf de Bruora holding it on his behalf. The manor’s owners changed many times over the centuries eventually ending up with the Kelly family in whose ownership it remained until the late nineteenth century. It falls within Tavistock Deanery for ecclesiastical purposes. There is a strong earthwork at Castle Head about ½ m. SSE. of the church, in the neck of a great loop of the Tamar, looking across to the earthwork of Carthamartha on the Cornish side. The date of these frontier earthworks is unknown but is probably Early Iron Age. Dunterton church (All Saints) stands alone. It is mainly a 15th century building; some 14th century work survives in the S. door way and S. Aisle. The church was renovated in 1891 at a cost of £150, with Mr. Burt carrying out the work. Monuments in the Church; above piscina in chancel, engraved slatestone to Matthew Brayford Chyrurgeon, son of Thomas Bayford, 1714. Square panel with inter twined foliage around edge. Also to Thomas Brayford, rector of parish, died 1678. On north wall of chancel, C19 monument of Rev. William Royse rector. In tower, several well engraved slate lids probably from tombchest. On south wall, slate with strap work. Include monuments to Francis —- died, 1736 and Philip and wife Isabella, c1682. The church was once known locally as the ‘Plague Church’ as tradition has it that when the ‘Black Death’ was encompassing the area, much of the population around the church perished. To escape the horrific disease, several children took refuge in the church and survived. Tradition has it that there was a village around the church but this disappeared at the time of the Black Death. In his book ‘Discovering the River Tamar’ John Neale tells of a rogue that lived rough in the parish. The story goes that during the eighteenth century, a colourful character lived in a cave in Dunterton Wood. He was Nicholas Mason, who came, by all accounts, from a respectable family. Mason was a notorious thief who carried out his nefarious deeds in a singular fashion. Late at night he would climb up onto the roofs of the larger properties in the district, lowered himself down the wide chimneys, and stole whatever he could, then made his escape back up the chimney. These mysterious thefts caused considerable consternation in several households in the district when in the morning it was discovered that possessions were missing and there were no signs of a forced entry. Mason’s exploits became such a problem that householders were forced to fix iron spikes and hooks in the chimneys to prevent his entry. Seemingly, it all came to a sticky end when Squire Kelly was exercising his hounds who picked up the scent of discarded bones, which led them to a cave and Mason was discovered. Squire Kelly’s suspicions were aroused and Mason was later found with a considerable quantity of stolen property in his possession. He tried to escape but was discovered among rocks above the river Tamar. He pulled a pistol and fired at one man but luckily missed his pursuer. He was later arrested and faced trial in Exeter where he was found guilty and hanged.